The Polish archaeological mission directed by Prof. Dr. Karol Myśliwiec continued its work west of the pyramid of Netjerykhet in Saqqara from August 30 to October 22, 2006. 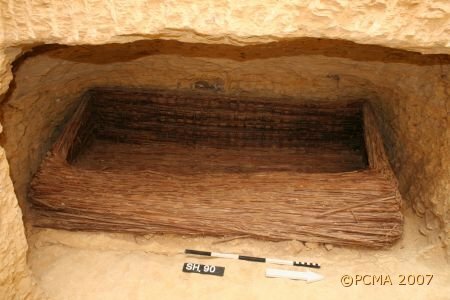 The season was geared to completing the documentation for the third volume in the Saqqara excavations series (following the publication of the Tomb of Merefnebef in 2004 and T.I. Rzeuska’s doctoral dissertation on Late Old Kingdom Pottery from the necropolis, out in 2006). The next volume will cover the Upper Necropolis found in the layer of sand spread over the remains of late Old Kingdom mastabas. Work on successive publications (on the Old Kingdom necropolis between the pyramid enclosure and the Tombs of Merefnebef and Nyankhnefertem, and the funerary complex of Nyankhnefertem) also progressed with further studies and documentation being carried out on site. 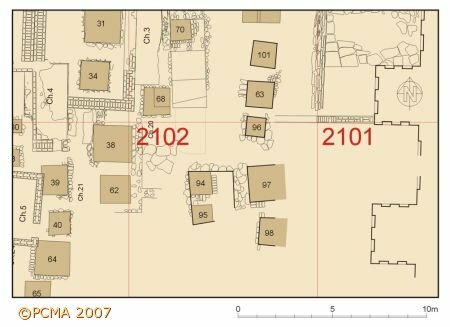 Additional clearing in the area excavated in 2004 and 2005 (squares 1903-1905, 2002 and 2102) brought to light another 27 late burials. These were fully studied, also anthropologically, and the mummies, cartonnages and objects subjected to conservation. 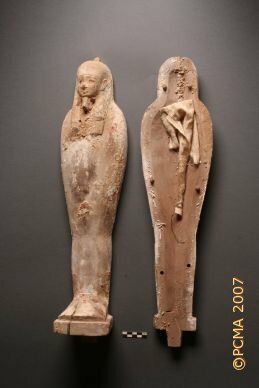 Most of the burials proved to be plundered already in Antiquity, but there was one case of a Ptolemaic period burial (no. 483) found intact. It yielded a mummy wrapped in a fine cartonnage, a wooden statuette of Ptah-Osiris-Sokar and a richly decorated Canopic chest, also of wood, all requiring the immediate attention of the Mission’s conservators, working under the supervision of Zbigniew Godziejewski from the National Museum in Warsaw. Shafts from the Lower (Old Kingdom) Necropolis were also investigated, including some that were re-cleared for recording purposes, others that had already been discovered in previous campaigns but not excavated and, finally, five shafts which were located only this season. In six burials, the body had been placed in coffins made of papyrus reeds and covered with a reed mat. 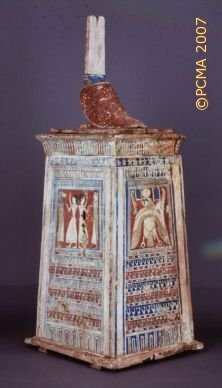 One case of papyrus-reed coffin (in Shaft 83), found wrapped in white tape bound three times on the coffin top, demonstrated how the ancient robbers had expertly slit the tape where the upper edge of the case meets the lid, replacing it carefully after they had removed everything of value from inside the case. The area of Shafts 63, 96, 97 and 98, previously concealed under the mud-brick platform adjoining the enclosure wall of the pyramid, was investigated thoroughly this season and found to contain further remains of structures from Old Kingdom times. These structures enlarged or changed the original shape of the superstructure connected with the monumental false tomb, possibly of Archaic or early 3rd Dynasty date, hewn in the rock below these structures, and explored in the campaigns 2004-2005. 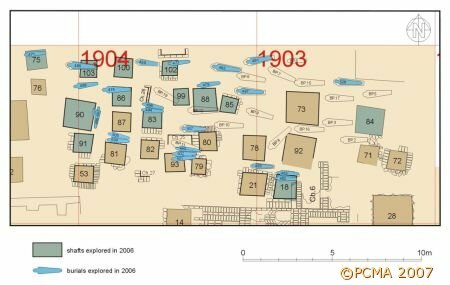 At least five different paved levels corresponding to successive phases of occupation were identified. The uppermost one was certainly connected with Shafts 38 and 62, functioning undoubtedly at the close of the 6th Dynasty or at the beginning of the First Intermediate Period. As for the lowermost one, a level extending south of the cliff frame bordering the top of a wall with the entrance to the archaic false tomb, it probably extended northwards alongside the rock-hewn sloping passage discovered here last year. Inside the cult chapel of Nyankhnefertem, the team tested for shafts in front of the three false-doors in the western wall and found none, gaining certainty that the two large-size shafts discovered east of the chapel in 2005, the northern one containing a burial chamber, were the burial and the ritual shafts of this mastaba. Prof. Dr. Maria Kaczmarek and Dr. Salima Ikram, specialists long associated with the mission, continued studies in their respective fields, physical anthropology and paleozoology. Prof. Dr. Jarosław Zieliński concentrated on paleobotanical remains.